Of 51 RAF bombers that set out, 17 were lost in transit. The author has not only covered the RAF failure and cover up, but also shown how the initial work of developing a network of airfields was to be exploited by civil crews racing each other from Britain to Australia in similar large British WWI strategic bombers. DESCRIPTION: By coincidence, this book arrived for review shortly after a book from another publisher covering the record breaking flight across the Atlantic by Alcock and Brown. What the two books share is the under told story of the long range bombers built by the British during WWI and the innovative approach to aviation by British Naval Aviators. The Royal Navy conducted extensive tests with towed man carrying kites from 1903, ordered the first naval airship in 1909 and started formal aviator training in 1911. Through the long history of British naval aviation, politicians have tried taking aircraft away from the Royal Navy, only to be forced to return marine aviation to RN control. After an impressive start, the RN lost control of its embryonic air force to an Army led Flying Corp. Fortunately for Britain the RN regained control weeks before the outbreak of WWI and were able to put in place the technology they had continued to research and consider. The result was that an RN floatplane made the first successful drop of a torpedo from an aircraft a month before the start of WWI, and RNAS Short floatplanes sank the first enemy ships with torpedoes in the following year. Naval officers had already written tactical books for the deployment and operation of naval aircraft and work had been carried out in conjunction with commercial aircraft manufacturers to develop mechanical bomb aiming and release systems, developing depth bombs for use against submarines and armour piercing bombs for use against armoured surface ships. At the same time, work was underway to equip airships and aeroplanes with wireless telegraphy and tests had been undertaken with radio telephone transceivers, although many RNAS aircraft continued to carry homing pigeons. The result was that the Royal Navy entered World War One with genuine aerial weapons systems. In contrast the Royal Flying Corp provided the Army with frail unarmed scouting aircraft that had to return to headquarters to either drop exposed film plates and hand written reports in a bag with streamer attached or return to land and hand over the intelligence. This was done in aircraft produced by the Government aircraft factory. Using aircraft built by commercial companies, to RN specification, the RNAS pilots were able to carry out tactical and strategic bombing of port installations and airship sheds and factories from the start of WWI. German airships were attacked and destroyed in the air and RNAS aircraft were armed with machine guns and interrupter gear. The RFC was to later benefit from these RN innovations, adopting some of the outstanding Sopwith fighters developed for the RNAS and light years ahead of the machines produced in the Government aircraft factory, the late exception being the excellent SE5A built for the RFC. Apart from relying on commercial manufacturers, several having long been RN contractors supplying ships and marine equipment, the RN benefited from starting by asking what might aviation offer and how could it be integrated into the Fleet. This approach to developing tactical manuals and considering strategic implications meant that the RN looked far beyond what was already available and was prepared to invest in pioneering development. The ability to fly aircraft on and off ships underway at sea was seen very early on as an important requirement and able to provide new weapons systems to extend the offensive capability of the Fleet. However, it was also appreciated that the most effective long range strategic bomber was a land based machine because it avoided the weight and drag of a flying boat hull and was too large for the carriers then available and due to enter the fleet during WWI. The RNAS therefore developed a dual process with efforts made to enable a fleet of carriers to attack tactical targets using carrier capable light bombers, and a fleet of large multi engine land planes to tackle strategic targets. Coordinated attacks by aircraft from several carriers did take place, but the war ended before RN plans to attack the German High Seas Fleet with a fleet of carriers could be executed and that attack had to await WWII and the strike against the Italian Fleet in port. The result of the twin development streams was to be large land based aircraft like the Vickers Vimy and the Handley Page O/400 for strategic bombing, able to operate deep into Germany while carrying one ton of bombs. They began to arrive as the RNAS was merged with the RFC to form the RAF, an ill considered political plan that was not to be reversed until 1938 when the politicians realized that cost cutting disguised as strategic restructuring was no longer possible and it was time to prepare for yet another major war. The situation was made more difficult because the senior RAF officers tried to exclude former RNAS pilots from what was seen as the RAF primary objective of winning a war by aerial bombardment. 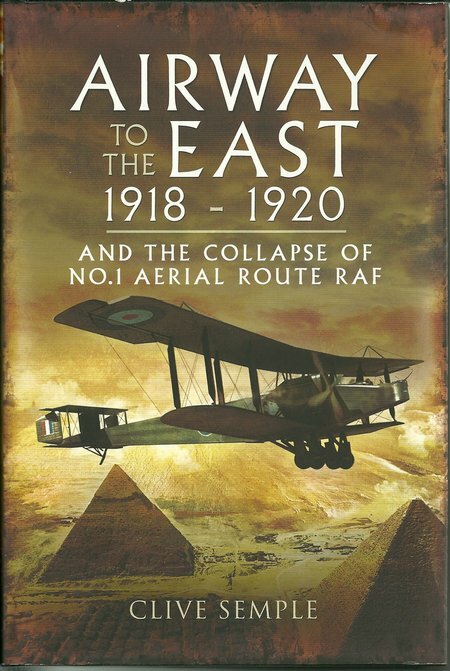 The author has taken the RAF plans to build an airbridge between Britain and the Middle East in the closing stages of WWI as the scale of the responsibilities to Arabs and Jews became apparent with the collapse of the Turkish Empire. The author has based his book on photographs and diaries discovered in an attic after his father’s death. The book therefore takes on a personal aspect, but the author has also researched diligently and uncovered an early RAF failure that had been hidden away since the 1920s in a deliberate and scandalous cover up. This has led to the book covering the related stories of the failures and betrayals of the Arabs and Jews by the victorious Allied Powers. The Balfour Declaration had promised the Jews a homeland in Palestine, which ran directly counter to the promises made to the Arabs when they helped to drive the Turks out of Palestine and Syria. In Egypt, the population was fortunate to have the committed services of Wingate Pasha who fought their corner during the negotiations to fix the post 1918 boundaries in the Middle East. The Arabs lost their most committed supporter when Lawrence was removed from Arabia. The Jews were supported by some British elements and by liberal Americans who supported a Jewish homeland without much thought of the implications to Arabs who had long lived in Palestine. The RAF proposed an air bridge to supply the British Army in Palestine, using Handley Page heavy bombers. It was a poorly prepared plan intended primarily to reinforce the justification for an RAF. It is difficult to imagine the RNAS making some of the basic mistakes made by the RAF and the failure should have resulted in the sacking of senior RAF officers and an urgent review of the best way to operate military aviation. Of 51 RAF bombers that set out, 17 were lost in transit. The author has not only covered the RAF failure and cover up, but also shown how the initial work of developing a network of airfields was to be exploited by civil crews racing each other from Britain to Australia in similar large British WWI strategic bombers. There is a colour plate section in the book, but most illustrations are in b&w images embedded in the text to produce a lavishly illustrated work that displays some very rare photographs, most of which have not appeared before. This is an absorbing and rewarding book that exposes scandal and gives a much needed airing of the innovative work by British Naval Aviators that could have been much better employed by the young RAF. History has shown that the RAF has consistently failed to learn lessons and recently demonstrated by their desire to scrap a new fleet of advanced Nimrod maritime patrol aircraft, that had already been paid for by the taxpayer, because they had little interest in maritime affairs but wished to retain the Typhoon II jet fighters that were designed to meet Cold War threats.